The global diabetic ulcers treatment market was valued at approximately US$ 7.3 Bn in 2017. It is projected to expand at a compound annual growth rate (CAGR) of more than 7.0% from 2018 to 2026, according to a new report published by Transparency Market Research (TMR) titled ‘Diabetic Ulcers Treatment Market – Global Industry Analysis, Size, Share, Growth, Trends, and Forecast, 2018–2026.’ Expansion of the health care industry, government initiatives, increase in health care expenditure, rise in product approvals, and increase in the patient population are projected to augment the global market from 2018 to 2026. 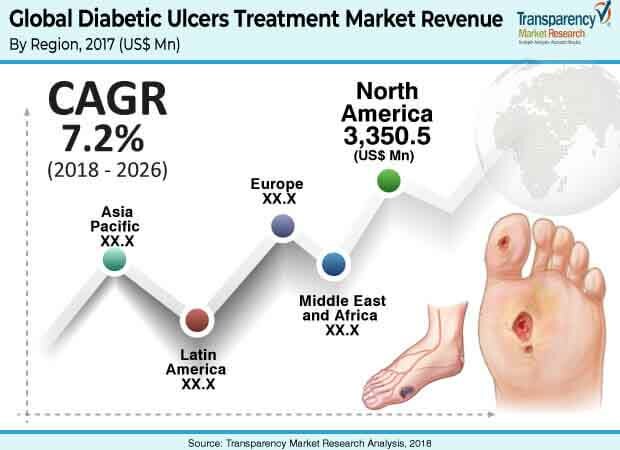 North America and Western Europe are likely to account for a dominant share of the global diabetic ulcers treatment market, as key players introduce their new diabetic ulcers treatment in these developed regions. Development of health care infrastructure and high medical expenditure by governments in emerging economies, such as China and India, are likely to boost the diabetic ulcers treatment market in Asia Pacific at a CAGR of around 8.3% from 2018 to 2026. High cost of newly launched and technologically advanced wound care dressings and products restricts their consumption. Conventional wound healing products are preferred over technologically advanced dressings, despite the low healing process of the former. The price-sensitive emerging markets hamper the expansion of advanced wound management technologies. In terms of revenue, the diabetic ulcers treatment market in Asia Pacific is projected to expand at a CAGR of over 8.0% during the forecast period. Expanding economies in Asia Pacific offer significant opportunities to diabetic ulcers treatment manufacturers. Emerging economies such as India, China, Brazil, Mexico, and South Africa have a large number of underserved patients, which makes Asia Pacific an emerging market that offers considerable potential. Expansion of the market in the region can be ascribed to the emergence of strong local manufacturers, offering technologically advanced products at lower prices, and increasing awareness among people about early diagnosis of chronic wounds. The report also provides profiles of leading players operating in the global diabetic ulcers treatment market. They include Smith & Nephew plc, Integra Life Sciences Corporation, Hill-Rom Holdings, Inc., MölnlyckeHealth Care AB, Essity Aktiebolag, Cardinal Health, 3M Healthcare, B. Braun Melsungen AG, AcelityL.P., Inc., and ConvaTec, Inc. Increase in mergers & acquisitions, strategic collaborations, and new product launches are expected to drive the global market during the forecast period. Additionally, strong product portfolio, high brand recognition, and strong geographic presence are expected to boost the market during the forecast period.